A grower's strike in Mexico has strained avocado supplies in the U.S. If you've had a hard time finding avocados in stores or guacamole in restaurants, you're not alone. Supplies of the fruit have been squeezed in recent weeks in the aftermath of a growers' strike in Mexico that halted imports. The strike, which started at the end of October, was the result of a dispute between avocado growers and packing and distribution companies in the Mexican state of Michoacán, the country's largest producer of avocados. During the 16-day strike, weekly shipments plummeted, falling from 40 million pounds of avocados the week of Oct. 28 to 4.8 million two weeks later, according to data from the Hass Avocado Board, an industry promotional group. 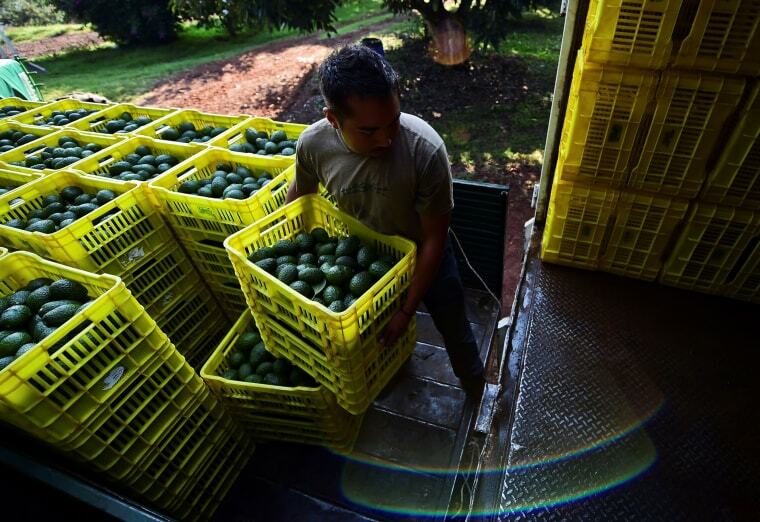 The Asociación de Productores y Empacadores Exportadores de Aguacate de México (APEAM), an avocado industry group that manages the “Avocados From Mexico” brand, announced an agreement between the two sides in a Spanish-language press release on Nov. 14. Despite the resolution, one distributor says that it will take time for the avocado supply to return to normal. Coastal Sunbelt Produce, a Maryland produce and dairy distributor that serves the mid-Atlantic, wrote in its weekly market report on Monday that it could take "at least 3[sic] weeks before supply chain is replenished." The avocados that have been coming over have literally been hard as rocks. "Volume around the holidays is very difficult as it is,” said Jason Lambros, Coastal Sunbelt Produce’s vice president of food. “The avocados that have been coming over have literally been hard as rocks. For us to warm them up and ripen them takes time." According to the Hass Avocado board, Mexican-grown avocados accounted for 78 percent of all Hass avocados shipped in the U.S. in 2017, so a disruption in production can have far-reaching effects for businesses. The lack of supply has forced restaurants to pull avocados and guacamole from menus. Dos Toros Taqueria placed signs in restaurants informing customers of an avocado shortage, while Chipotle apologized to customers on Twitter. Dos Toros representatives declined a request for comment. A Chipotle spokesperson denied that the company experienced any avocado supply shortage in an emailed statement to NBC News. Restaurant chain Dig Inn emailed this to customers on Nov. 14., citing the avocado growers strike: "Instead of serving a stockpile of frozen avocados and compromising on quality and taste, we've temporarily taken avocados off our menu." Taylor Lanzet, Dig Inn’s Director of Supply & Sustainability, told NBC News that the chain's supply of avocados had been strained since the start of November. "Things have been looking bad for about two weeks," Lanzet wrote in an email on Nov. 16. "Once rumblings of the disagreement started, prices started to rise and we began to notice that supply was becoming more limited."